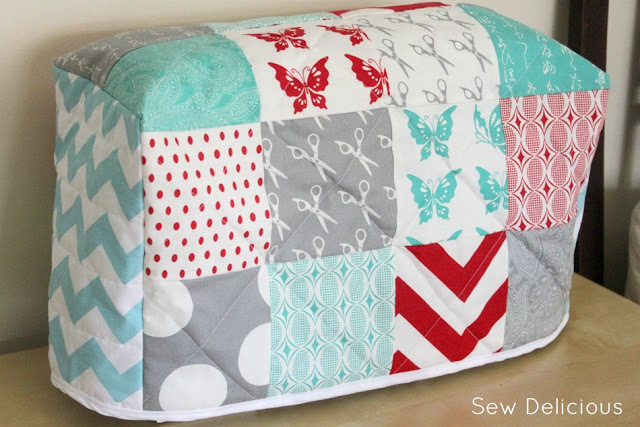 Recently a lady named Rebecca contacted me through facebook and asked if I would make her a Quilted Sewing Machine Cover like the one from my tutorial. She said that the range on Etsy was fairly limited and weren’t colourful and modern, which is what she was after. She felt that my machine cover tutorial was a bit beyond her skills, so could she commission one from me? I said yes – I was looking forward to an excuse to make a few more. I made three – one for her and two more just for fun, with a plan to experiment with some fabric combinations and put the remaining two in my Etsy shop. A couple of times I forgot what to do next and had to refer to my own tutorial – haha! 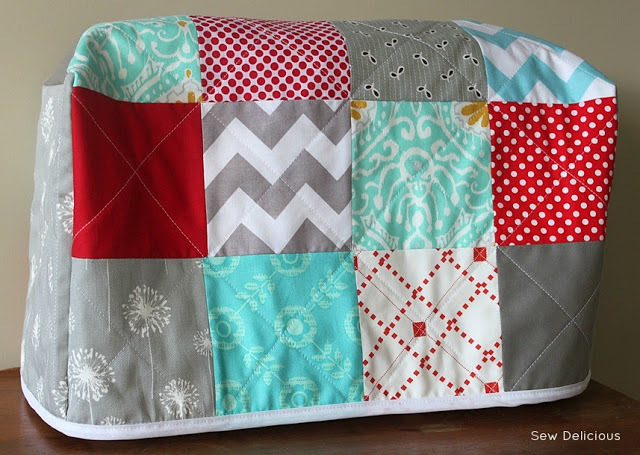 Rebecca didn’t have a particular fabric combination in mind but she told me that she really liked my original one in the aqua, grey and red. 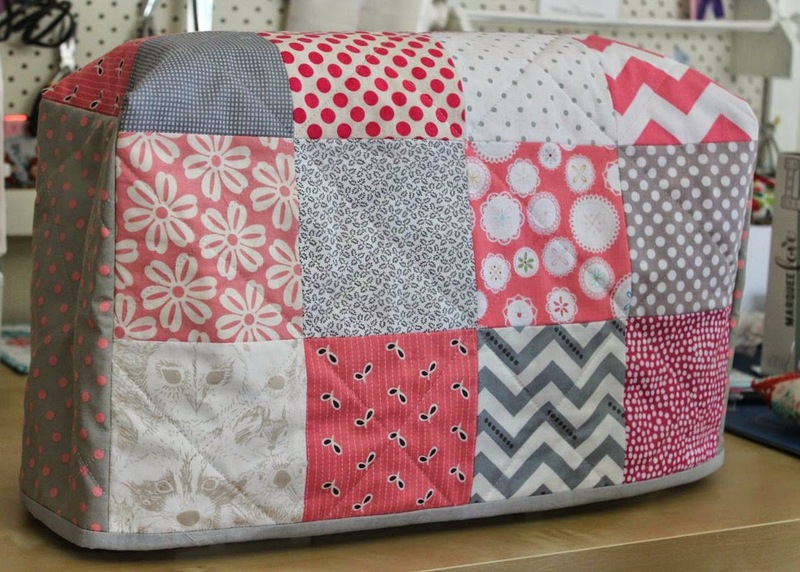 So I recreated it, but using a range of different fabrics because Half Moon Modern is virtually impossible to find now. (Puh-leeeeeese Moda, reprint it!) You can spy some Little Apples, Chevrons, Denyse Schmidt and Cuzco in this latest one. The second one I made using some sewing inspired prints. I included a measuring tape and selvedge print and teamed them with some coordinating bright solids, spots and chevrons. It’s really bright and fun. The final one I didn’t even get the chance to photograph except for a quick upload to instagram. I made it using exactly the same fabric combination as I did for this quilt, so this picture will give you an idea of what it looked like. The only difference is that I didn’t include any pink fabric, it was mainly green and blue. They never made it to Etsy…a couple of ladies who follow me on instagram and facebook snapped them up very soon after I shared them! Which was wonderful and they have now jetted off to new homes in Illinois and Maryland in the USA. I’m thinking I might make a few more every now and then and list them on Etsy. Watch this space. Wow I knew they would sell fast 🙂 yay! 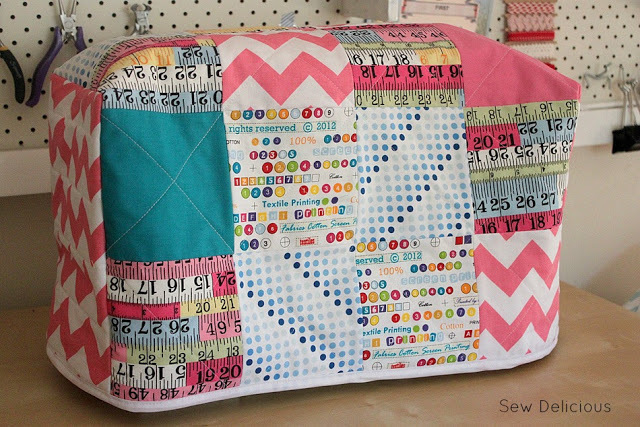 These are such a great idea, and a great way to coordinate the colours/patterns to the sewing room. 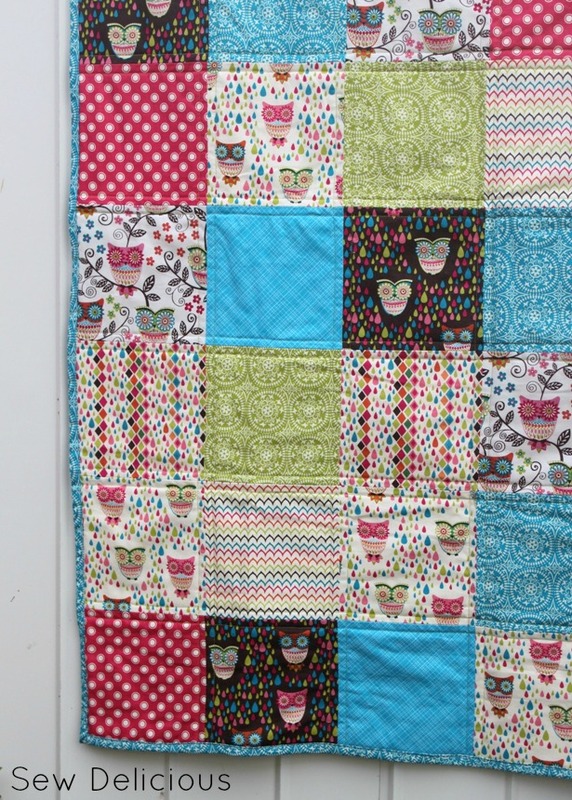 Being a non-quilter I can easily see why these have been snapped up so quickly. Love the sewing inspired one! 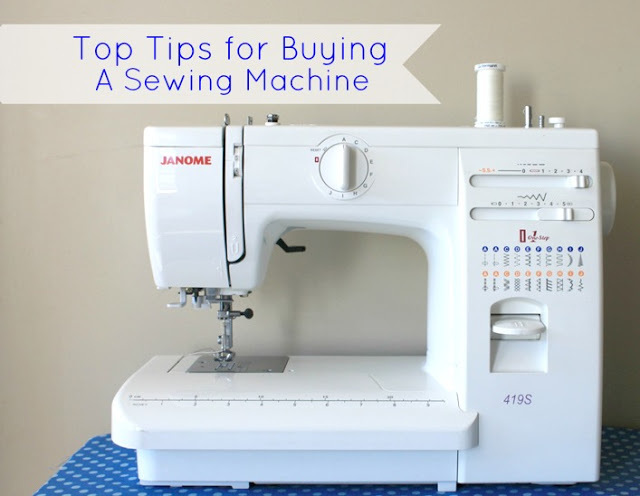 If only I didn't have a hard cover for my machine I'd be getting you to make me one too Ros. Love all of them. Love the second one! I would have snatched it up too. Im so happy you where contacted and able to sell. Every little bit helps now a days. I hope Im not being too bold. But is there a pattern for this. I love it a and would love to try my hand at one. Right now I am using a plastic unattractive cover. Congrats!!! I can't wait to see more! 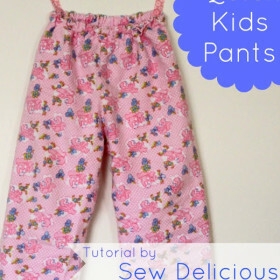 I love the one with the sewing pattern prints!